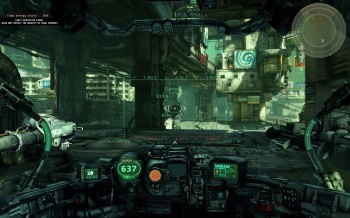 Hollywood snaps up the film rights to Adhesive games' oh-so-pretty mech shooter Hawken. Two-month-old production company DJ2 Entertainment bought film rights to the upcoming multiplayer shooter based on its absolutely stunning trailer. According to DJ2's Dmitri M. Johnson, tiny indie outfit Adhesive Games was hesitant to give up the rights until he spent some time hobnobbing with the developers to prove his gamer credentials. "I assumed someone already got it because it was so huge. Big names were chasing this," he said. "A-list directors and big hit agencies." It follows two young pilots from separate clans pitted against one another after a devastating virus has covered most of the heavily industrialized planet surface in toxic crystal. They witness an event that suggests there is more to the nano-virus than meets the eye. Now the race is on to discover the virus' origins and true purpose before their respective clans wipe each other out in a final, climatic battle. Okay, so it's not exactly Shakespeare (although it is, apparently, at least according to Johnson's earlier quote) it does seem like more than enough justification for the average movie-goer to sit and gawp listlessly at giant robots while they shoot at each other for an hour and a half.